There are two common modes for transferring files via FTP, ascii and binary. To see what files are transferred in 'ascii' mode, from within Core FTP, go to view -> options -> extensions -> Ascii extensions. 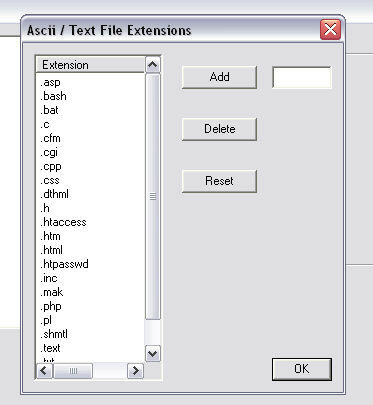 In this screen you can add or remote file extensions of files that you wish to be transferred in ascii mode. The most common file extensions are already listed. Core FTP is setup by default to select binary or ascii mode automatically. Files that are in the ascii/text file extension list are transferred as ascii, all other files are transferred as binary. If you wish to set the transfer mode manually, you can select any of the following buttons in the toolbar at the top of the Core FTP main Window. The first button is ascii mode, the 2nd binary, the 3rd, auto mode (default). If you are transferring files from Windows to a Unix based server, Ascii mode will strip out the CR (carriage return) characters found at the end of each line. You may notice that the file you uploaded is smaller than your local file. This is completely normal and is nothing to worry about.